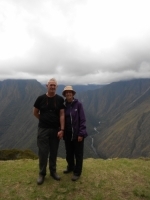 The Inca Trail with Inca Trail Reservations has been the highlight of my travels ! From start to end, our tour guide Manuel has been informative, helpful and very funny. He kept us going with a positive attitude when the trek was getting difficult and kept us organised on those early mornings. Juan Carlos our guide was a wonderful guide. 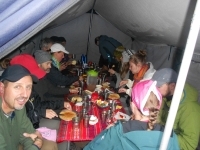 The trip was wonderful too and all the porters and cooking and other guides were caring and careful of our needs. 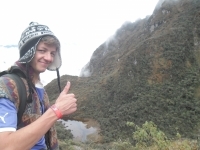 Machu Picchu was all I expected, and well worth the effort of the walk. We were well looked after. Didn't know what to expect and was quite apprehensive. Would I be fit enough to do this at 49 years old? Needn't have worried. 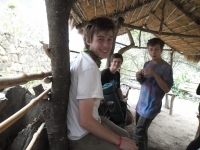 Guides were great - they knew when I needed a rest and I never felt hurried. 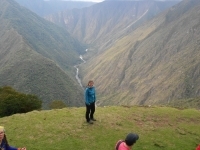 Had loads of time to enjoy the spectacular views and explore Inca ruins on route. 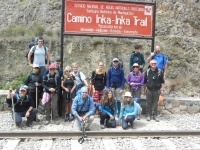 At the end of September we went on the Inca Trail with our guides and our porters. 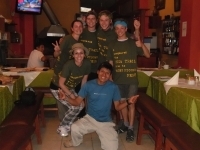 The first day was an easy one with interesting facts about Inca ruins, history and the vegetation. 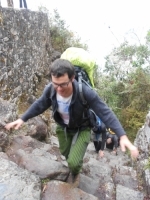 The trail lead us through plains and also rainforest which was a real change to the dry mountains. Hey ! 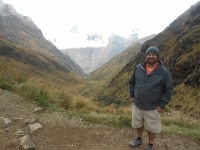 I went to Machu Picchu via the Inca Trail for four days in the end of September and I have to say that I was surprised how cool it had been ! We were walking in a very nice group of people of every age from many different countries. It was an exhausting, but fun experience. 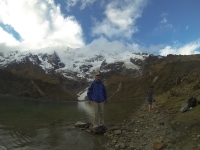 The first day started out alright, just a good way to start a trip like that, because it was not too exhausting and there were not too many uphill parts. As a fifty-something, with a bit of a beer belly, I was a bit anxious about fitness levels for the trip. Rightly so ! It was hard ! 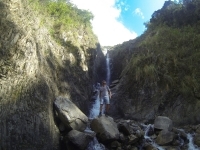 But it was so worth it, our guides were very knowledgeable and effective. It was very challenging. On most days I pulled up the rear but got a lot of support from the guides which I greatly appreciated. While I've had the opportunity to visit Machu Picchu via train in the past I couldn't have asked for a more wonderful adventure stepping in the footsteps of the Incas. Wonderful, challenging journey with great guides and lots of fun travel companions from many countries. Great camaraderie. More stairs than most people will walk in a lifetime. I wished I just packed less. Wasn't a mountaineering expedition, though the elevation made it feel like one. We had a great experience from the beginning. The communication was great and Mabel was great at answering our questions and helping with suggestions. The meeting in Cusco was very informative and helpful. This truly was an adventure of a lifetime. 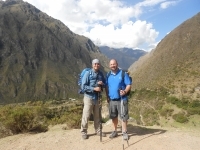 We had a fantastic experience on the Inca Trail . The trek was challenging but worth every step. The sites along the way were breathtaking and the ruins were amazing. Ha sido una aventura dura y exigente, pero a la vez maravillosa y algo que recuerdas para toda tu vida. Merece la pena intentarlo y formar parte del grupo de personas que consigue finalizar este trek de manera exitosa. Anstrengend, kalt… mit einem Wort: genial! Alles fing ganz harmlos an mit einer kurzweiligen Fahrt im Bus zum Startpunkt unserer ersten Tour. Die erste Wanderung war ebenso schön wie entspannt. Darauf jedoch folgte die kälteste Nacht meines Lebens. Der nächste Tag hat jedoch für alles entschädigt.